School buses are one of the top places where childhood bullying happens. Think about it: there are fewer adults around, a captive audience of peers, and a bus driver focused on the road―unable to monitor everything and intervene as needed. Many of us have our own childhood memories of bus bullies, but as parents the situation presents new challenges in knowing how best to handle the situation and help our children. Children being picked on aren't always comfortable telling others about it or asking for help. But there is also something called "parent's intuition"—knowing when something is bothering your child. If you're not sure, try asking some of these questions. You may not suspect something is wrong until your child starts coming up with excuses to not take the bus or starts avoiding school entirely. This is a red flag; see School Avoidance: Tips for Concerned Parents. Bullying can also cause stress-related physical symptoms such as headaches, stomachaches, nausea, and dizziness. Realize that kids don't have conscious control over these symptoms―and they're definitely not them making them up. Kids may worry that if they report the bullying, it will lead to more bullying (retribution). Sometimes, younger children may not even recognize bullying behavior for what it is or know what to call it. Of course, some bullies will make outright threats about what may happen if a child tells someone. School buses are an extended part of the school environment, so they likely are covered in your school's bullying prevention policy. The bus driver, other adult staff, and the school have a legal and ethical responsibility to ensure children feel safe, valued, and welcome on the bus. Although bus drivers can't always step in when bullying happens, many are very aware of the interactions between their young passengers and can provide some helpful context. Talking with your child's bus driver in the middle of a route can be difficult, but a call to the school can help in setting up time that isn't so awkward. 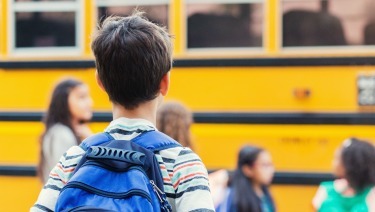 Data collected from a 2010 nationwide survey by the National Education Association shows bus drivers are not only aware of bullying but also want to know how best to help. Going in with the right mindset can make a big difference. So, rather than focusing on "my child is being bullied," try saying "my child is in a difficult situation." Then, you can help your child handle it by exploring what the cause may be. One of the toughest situations for parents to work through is if the perceived bully is a staff member. A bus driver who is strict with rules may be entirely within reasonable bounds, but it may be perceived by a child as targeting him or her unfairly. Of course, some staff may also truly be bullies. Make sure you get all the details without any prejudging. Even if your child isn't the direct victim, you can still report the bullying behavior when your child witnesses it. Depending on their age and the situation, children who see the bullying happen may not feel comfortable getting involved but speaking up can have a big effect; bullies often back down if someone else calls out the behavior. Most importantly, have conversations with your child to make sure they know it is never OK to join in on bullying. While not all bullying cases need extensive involvement by school administration, schools have a responsibility for providing a safe learning environment―the vast majority will take bullying on the bus seriously. Don't be afraid to keep going up the chain of command. If your child's school does not take the situation seriously or it is not adequately resolved, your pediatrician may be able to help advocate on your behalf with the school. In the meantime, investigate alternative options for getting to and from school such as carpooling or a moving to a different bus route. If you're unsure whether your child's symptoms are due to bullying or some form of physical illness, let your pediatrician know. It can only help. Bullied children have illnesses, just like anyone else, and deserve to have a proper evaluation. Always call the pediatrician if you notice any significant physical or emotional symptoms lasting more than a few days or substantial drop-offs in academic performance. Once physical illness has been eliminated as a cause of your child's symptoms, work on understanding the pressures the child is experiencing on the bus and at school.